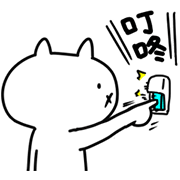 The popular Japanese sticker series, Intense Cat, is now bringing his intensity to Taiwan! Sometimes cute, sometimes weird, but always exciting, this kitty’s super fierce animated reactions will bring the energy to all your chats! Let these cute, original, and intense stickers help express your surging emotions! The Intense Cat series is here with its very own official sticker set! Sometimes cute, sometimes weird, but always exciting, this kitty's super fierce animated moves will bring the energy to all your chats. Cat pals Tango and Master are here too! Let these adorably intense stickers help express your surging emotions.